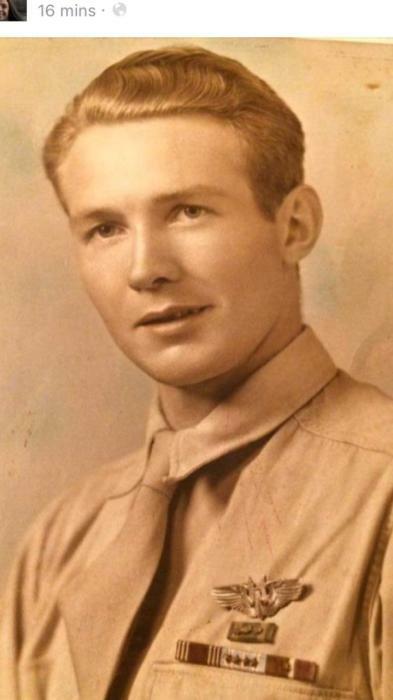 Beloved husband, father, grandfather and great-grandfather, Kenneth “Kenny” Wheeler Ives, 93, of Kellogg, Idaho, passed away August 27, 2018 at the Shoshone Medical Center of Kellogg. He was born May 4, 1925 in Tilden, Nebraska; Kenny was the son of Fred and Bertha (Wheeler) Ives. Kenny attended and graduated from the Groton High School of Groton, South Dakota. He served in the Army Air Force during WW II, flying a B-24 and making 46 missions. Kenny moved to the Silver Valley in 1950 from South Dakota. Kenny first married Emogene D. Syhre on September 28, 1947 in Pierpont, South Dakota; Jean passed away on November 13, 1985. He then married Linda (Case) Legard on February 13, 1988 in Kellogg, Idaho. After Kenny moved to the Silver Valley, he worked for the U.S. Forest Service. He then studied and entered the field of T.V. and electronics; he owned and operated Ken Ives T.V. operating in several locations in Kellogg; then in 1976, he owned and operated Ken Ives T.V. & Radio Shack; Kenny retired in 2008 at the age of 83. Kenny was a member of the Kellogg Elks Lodge #1841, a member of the Kellogg Bowling Association, a member of the V.F.W., a member of the Kellogg Chamber of Commerce and a member of the Silver Valley Horseshoe Association. Kenny loved and enjoyed his family, fishing, camping, bowling, horseshoes, dancing and taking care of his yard. He was also an avid Gonzaga, Seattle Seahawks, and Seattle Mariners fan. Kenny is survived by his wife Linda Ives of the family home of Kellogg; four children Linda Brainard of Caldwell, Idaho, Geri (Jerry) Napolitan Kuisti of Kingston, Idaho, Karen (Randy) Carlson of Hayden, Idaho and Lance (Twylah) Ives of Kellogg; two step-sons Brian Legard of Osburn, Idaho, Aaron (Alena) Legard of Osburn; nine grandchildren, twenty-four great-grandchildren and one great-great grandchild on the way. He is also survived by numerous nieces and nephews. Kenny was preceded in death by his parents, his first wife Jean, one daughter Rhonda, one brother Don Ives and one grandson Anthony Legard. A Celebration of Kenny’s Life will be held on Thursday, September 6, 2018, at 1:00 P.M. at the Our Savior Lutheran Church of Pinehurst, Idaho with Rev. Ken Bartle officiating. A reception/luncheon will be held in the basement of the church following services. The family suggests that memorials may be made to the Kellogg Elks Lodge #1841, P.O. Box 608 Kellogg, Idaho 83837.